1. Peel off the skin of potato and grate it like straw or as shown below in the image. Soak the grated potato in a water for 4-5 minutes. Drain and wash in running water for 2-3 minutes. 2. Drain and wipe dry using a cotton cloth or towel. Place the grated potatoes on a 45mm. (“2″) diameter metal vegetable or tea strainer and top with a second strainer as shown below in the image. You can choose the strainer small or big according to the size of basket which you want to make. 3. Hold tightly and deep fry the basket on a medium flame till basket is light golden in color. 4. Switch off the flame and remove the strainer from the oil and invert it and tap lightly to unmould the basket perfectly. Combine Boiled potato and chickpeas in a medium bowl. 5. 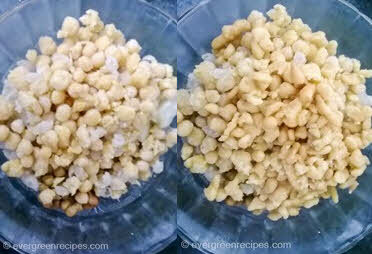 Soak boondi in hot water for 5 minutes and drain the excess water. Now add soaked boondi and boiled matar in a bowl. 6. Then add chopped tomato, coriander leaves, green chilli, red chilli powder, black salt, salt, 1 teaspoon tamarind chutney and 2 teaspoon yogurt. 7. Mix it well. Now filling is ready. 8. Put 1 cup of filling in the basket as shown below in the image. 9. Top with tamarind chutney, yogurt and green chutney. 10. 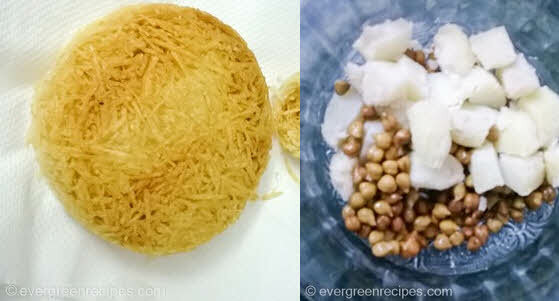 Garnish with coriander leaves and sev, and enjoy this delicious and lip smacking chaat at home.